we go see art: How is terrorists' ideology incorporated to recruiter's thinking? How is terrorists' ideology incorporated to recruiter's thinking? ISIS is not the earliest who fully use the internet but al-Qaeda. Al-Qaeda has three categories of websites - the official website that leader convey their speech, recognized figure of group member who discuss strategies and websites created by followers or supporters . Therefore I shall open range of terrorist group research instead of just focuses on ISIS. Many pre-terrorists were seeking solution of their anger on internet, eventually influenced or brainwashed by extremist ideology. In my opinion, many jihadists are not really join terrorist group for religion's sake, but they use it as an expression or revenge to the world. Their extremist mindset is true, but their real intention is never as simple as just for jihad movement, it involves many personal criteria that is hard to understand by outsiders. Lets look it in realistic way, joining ISIS can solve their poverty problem as they provides shelter and food, give (brainwash) them a reason to the road of glory, just like how the young men were persuaded to join army in World Wars. Diagram 1: A girl calling her sisters to join ISIS with her on Twitter. Why does female joining ISIS? 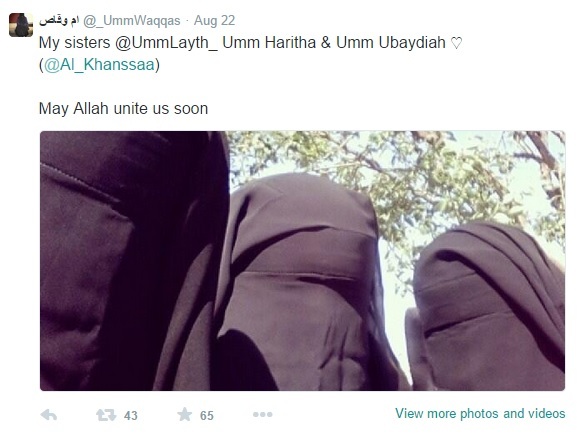 First, we loook at why women still join ISIS as we always heard women being stoned and raped in caliph? Founder of a feminist group Zainab Salbi explained that women who want to join ISIS can separate into two type, the first group is young teenage girls who believe they can go back to the golden era of Islam kingdom; another group is elder women who think men as their provider of their living, they live by centralizing men as if they are born to serve men. Therefore, they follow what their husband says, including joining ISIS to serve Allah. For these women, ISIS is not wrong at all in punishing women to death, as they see ISIS as moral police. Those who were punished, that is their retribution (Frej, 2014). Diagarm 2: Anwar al-Awlaki in 2001 when he was an imam in mosque (Shane, 2015). Diagram 3: Anwar al-Awlaki in 2010, a photography of him with weapon used in al-Qaeda propaganda (Shane, 2015). 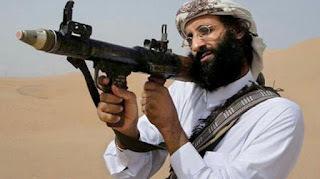 Anwar al-Awlaki was an American Islamic lecturer, black listed by United State as terrorist as he was planning terrorist operation. Searching his name on YouTube will result in video lecture explaining the Lives of Prophets, and as well video such as "Never Trust a Non-Muslim" as well. On Dailymotion, I found his Call to Jihad. After watching his videos, I found that this man is very persuasive in speaking as he has well-spoken English and Arabic, quoted sentences with Muslim's al-Quran, and emotionally provocative tone. He accused discrimination of America on Muslim. According to him, his "brothers" were cheering when they heard the news of America sending army to Yemen, because finally they have a chance to fight them, they are dare to die. So he challenged America. In the end of the video, he emphasized that they themselves are justice, protecting their homeland and religion while America is evil. He generated sympathy on "opression" of Muslims, for them to feel that Islam is threaten and they need to protect it through the holy war. At the same time he encourage them to join the group by showing the followers their ability in war for them to trust. This is a successful propaganda even a girl from Colorado turned to be a sincere follower of terrorist group and even planned her trip to join them. Read her full transformation that she posted on AskFm at here. Diagram 4: An ISIS pizza restaurant (Katz, 2016). ISIS content on social media is far beyond only beheading videos, they have other elements which aimed to bring out "needs, fears, desires, alienation and frustrations" (Katz, 2016). Despite the violent words in the diagrams of previous post, they also display daily lives in caliph, just like they have a holistic environment as other country. In summary, all the criterias provide by ISIS fits the Maslow hierarchy of needs. How can it not attractive to people? Person who is killed because of their religion or beliefs. Prejudice against Islam or Muslim.